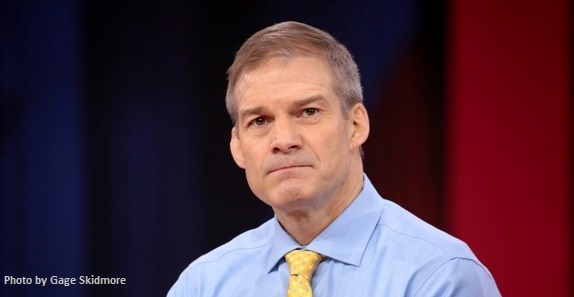 Our friends at the Eagle Forum, the principled grassroots constitutional conservative group founded by the late First Lady of the conservative movement Phyllis Schlafly, recently came out strongly in favor of Rep. Jim Jordan of Ohio to replace the retiring RINO Paul Ryan as Speaker of the House. - If the “compromise [amnesty for illegal aliens] bill” passes, this will not fare well for Republicans in the upcoming November elections. If Democrats gain control of the House, a much more liberal bill without any border security will be inevitable. - Republicans would not have been in this situation if we had true Conservative Leadership in the House. Speaker Ryan, Leader McCarthy, and Whip Scalise have all had a hand in allowing this fight to become so moderate. This is the perfect time to encourage support for Rep. Jim Jordan for Speaker. - Our grassroots advocates are very upset by the illegal immigration crisis and are confused by the flip-flop of Congress on this issue. They will be motivated to voice their support for new leadership, specifically for Jim Jordan who will go to great lengths to secure our border. Speaker Paul Ryan, Majority Leader Kevin McCarthy, and Republican Whip Steve Scalise are all complicit and part of the problem. If we had a principled conservative Speaker, like Jim Jordan, and a conservative House leadership team the country would be safer, and conservatives would not be given two bad choices as the only alternatives to address our border security problems. What’s more, polling shows that the American people don’t want amnesty and they are fed-up with leaders like Ryan, McCarthy and Scalise. A new national survey commissioned by our friends at ForAmerica, shows that 2018 Mid-Term Election likely voters across the board – be they self-identified conservatives, self-identified independents, and even self-identified moderates(!) – are even more likely to vote Republican if they knew the new Speaker of the House would come from outside the current Leadership apparatus. The poll by McLaughlin and Associates, potentially stunts the ambitions of GOP leaders like Majority Leader Rep. Kevin McCarthy (R-CA) and Majority Whip Rep. Steve Scalise (R-LA), both of whom are rumored to want to replace Paul Ryan as Speaker says our friend David Bozell, the President of ForAmerica.org. The polling shows that turnout would increase, in favor of the Republican Party, if voters were assured that those politicians would NOT get the job of Speaker. And these voters aren’t just from cherry-picked friendly House Freedom Caucus districts either. Voter desires for new Leadership knows no geographic bounds. Voters residing in the East (+10 percent), voters in the West (+6 percent), voters in the Midwest (+4 percent), and voters in the South (+2 percent) are all more likely to vote Republican if they know the next Speaker will not come from the current GOP Leadership team. You can read David Bozell’s CNS News column on the poll through this link. The ForAmerica.org poll shows what the Eagle Forum and other conservatives have been saying for a long time: It isn’t just Paul Ryan and Mitch McConnell, it is the entire existing Republican Capitol Hill “leadership” that is toxic to voters. Submitted by Ckm4cuqB2q on Fri, 06/22/2018 - 11:18. Agreed. We need Jordan. These other hotshots just aren't cutting it. House leadership is seriously broken and it's damn well time to fix it. This is not about our politicians, it is about the health of the country.